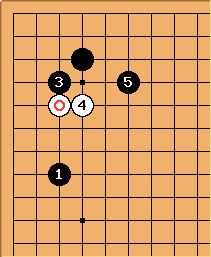 Now clearly this isn't joseki, but i have a lot of trouble knowing what to do. Playing a diagonal attachment to the bottom isn't good, because it doesn't threaten the tiger's mouth, and when black fixes he seems to get solid shape, solid territory, and a forcing move or two, not to mention sente. I can tenuki, but a pincer would be a bit nasty. Making a base seems a little weak, especially considering black can take my base whenever he feels like it. What would you guys do in this situation? As you said, the diagonal attachment a and 4-5 lean b are good local plays but lukewarm so early. 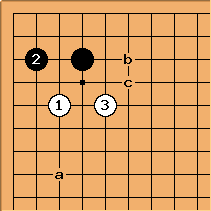 (If B b W c, black may be slightly ahead, but if possible white can push up, cut, and fight instead.) To these you could add attachment c, to be fancy (attempt to switch direction to the top...black shape is then a little awkward, but of course white assumes a separated position). d is pretty similar. The one point jump e is sente, but really doubling down on building the left side in a locally unfavorable way. Even a two point jump f is reasonable - better for building if its flexibility can be survived. The good news is that there are all these options, and black's immediate followups are just as lacking in sparkle*. In fact, the exchange of white's approach move for marked move is almost certainly a good exchange for white. So you can simply go do the next thing elsewhere. Timing when to come back depends on accurate counting and consideration, but it's soon if not now. Black is forcing some kind of compromise. You mentioned black would pincer - that's likely, but still could be making acceptable number of points just by leaving the white stone alone, light. The best an most likely move is a simple two-space extension to make a base. White probably needs a proper position on the left side, and the non-joseki stone would negate that for the approach move. 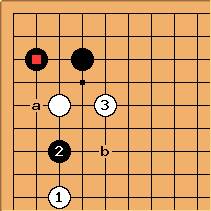 This leads to a perfectly acceptable position; black is not ahead enough on territory or influence to account for starting with the corner stone. There is no good (yet) way for black to take your base here. Like this? The invaded territory is not worth the influence, and white will no longer need a base in the same way. This alternative extension (or something high) is possible too, and may work better with formations in the lower left/center. Of course it's much more flexible, depending on tolerating black's invasion, and the fight or exchange for influence or if ignored, b territorial gain that entails. 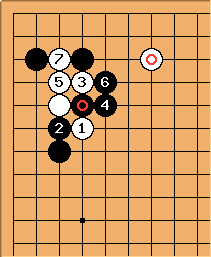 The marked black stone was a joseki move 400 years ago and was often played even by such a player as Honinbo Dosaku Meijin :) Of course, whether it is a good move or not depends on the situation in the rest of the board. Indeed, a basic move like the one space jump as a corner defence should rather be seen as a refreshing idea than a joseki violation. You shouldnt be upset by such a move. Neither should you focus too much on whether a move is joseki. This move defends the corner in a basic way. It is not very ambitious and rather single minded. So taking up a position at the Side is good enough. Then the game continues. At our level these moves make no big difference. White gains what in such An Exchange? 2 points? There are endgame tesujis that win you more. I'm not worried about it being joseki, it's just a way to ask the question in a way that makes it clear I can't just check a joseki dictionary to find responses. The move just tends to have some problems that I was interested in finding a response that satisfies the way I like to play. Dieter (same guy as anonymous IP earlier): Okay, it is an interesting question after all. Let's reason about it some more. As I said, is a very solid defensive move, making a firm base in the corner. 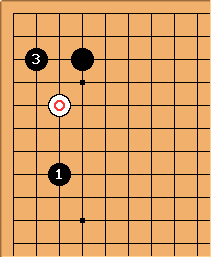 Being a move on the second line, it is also slow, if played as early as this diagram suggests - there seem to be no moves in the vicinity. The first question White should ask is "do I need to reply?" Black can attack this stone at a but even then will need another move (around the circled point) to kill it. The net investment for Black would be 3 stones for <30 points. That is not very efficient in terms of territory, not in this stage of the game. But maybe answering is even better. After , both have a base. 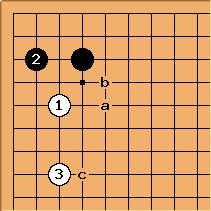 Later, a move at a or b will increase White's influence greatly, while Black's influence still needs to be built: is not having any influence at all, as it only provides stability. White has given away the initiative with because Black can now play elsewhere, as he's stable already. 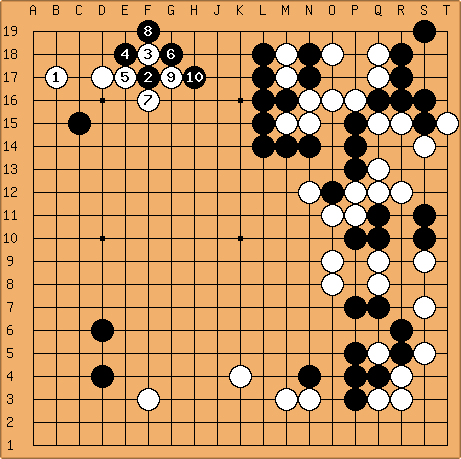 But this was Black's corner to begin with and he has not established any advantage in terms of territory or influence. That's not what you play first in a corner for. 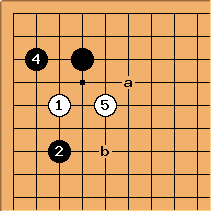 Other moves are conceivable, like c but essentially, all answers provided here, the tenuki, and c "punish" Black for his slowish . Don't think you have acquired a decisive advantage here. It's a very small advantage, which may accumulate to victory. This being a key point for both, after White played at a in the above diagram, White should perhaps play first, making miai of a and b. However, Black can now play c and build territory on the fourth line. If here, cuts and has proven its value by providing stability in the corner so that Black has only his cutting stone to worry about. The more I look at it, the less satisfactory I find any answer by White. Playing elsewhere before deciding how to continue might be best, as the situation is not urgent. Absence nearby stones on the lower left part of the board, locally I would like to play here. The Black move is low, surrounding such a small corner territory without so much of a potential for further expansion, so it feels somewhat better for White. The three-space high extension gives a nice high-low balance with the marked White stone, with possible future developments towards the lower left and center. 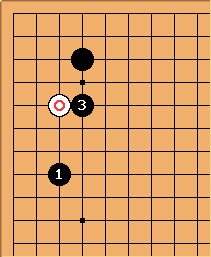 The main reason why my intuition points to the three-space high extension is due to the position of the two Black stones. These two stones are very solid and have a heavy emphasis for territory. In particular, the marked Black stone causes White to have an open skirt on the left side. As such, the value of the territory on the upper left side is greatly diminished for White. Hence, White should play high for emphasis on the outside, and any move that is too close to the stone feels overconcentrated. 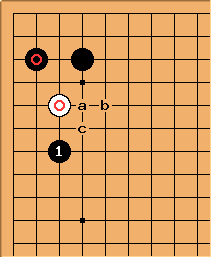 Additionally, if is played at a then there is a feeling that Black can actually attack at b, because the open skirt causes the base to feel somewhat incomplete. 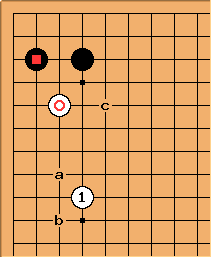 After , White can aim at expanding the influence with c. If need be, the stone can be treated lightly and sacrificed for even more influence. Alternatively, tenuki with is also an option. 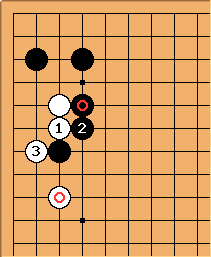 The exchange of the two marked stone already feels advantageous for White, simply because a regular approach move is answered by such a low move. For two moves, Black's guaranteed territory in the corner is only like six points. The original poster also asked about tenuki, and the severity of a pincer. Lets for the sake of argument we consider the pincer at - other pincers are similar. Lets do a tewari here. We let Black pincer first, and then allow White to tenuki. Don't you feel that is too slack? It exerts no pressure on the White stone at all. After this move, the stone is light, yet it is not easy to cleanly capture it with one additional move. In other words, is ineffective. 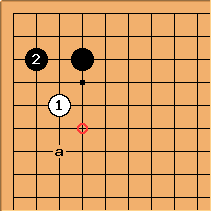 One ordinary move for to attach, forcing and making White heavy, and continue to attack with . 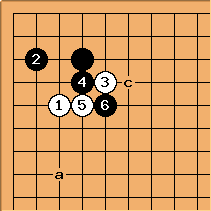 White cannot easily give up these two stones, and in the process Black can get additional benefits through attacking. Another common alternative is for to seal White in. White lives a small corner, and Black gets a nice outside influence. This is a good point for Black, with or without your preferred extension. a (alt. b) is quite a clean way to capture the stone, making both territory and influence. 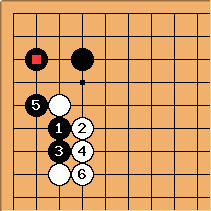 In terms of tewari, I believe white's stone is more likely to be worse than black's descent. Unless it is the very early opening or white can immediately pull it out, it will become an ineffective invading move of whatever formation black makes. Noted with thanks. I'll think about it. Nevertheless, here is likely a premature invasion (a worse mistake than shape), to which black's descent is still a reasonable defense. 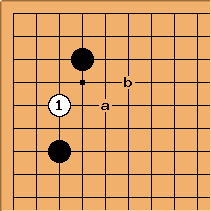 The exchange of a for b helps black make points, just as leaving the position alone allows black to keep building a framework. Another way to put this is white has ended up playing at a corner where black has two stones. White's approach is madness (too close to thickness, and also helps the black move good shape). Black's descent is of course definitively bad, but now it doesn't waste much more than a quarter of the value of that stone. Which is worse? It depends on whether white can pull out the stone and make it live, or get an excellent sacrifice result. To a first approximation, it depends on whether the sequence after white immediately jumps out is any good. Changing the order, is an odd move. After , there are plenty of escape routes. Black has focused too much on removing the base. doesn't make heavy, so the attack of loses its severity. proves that the tenuki of was well judged. In my opinion, neither a nor b qualifies as a "quite" clean way of capturing. In the opening stages, a possible answer to either a or b is to play elsewhere again. If Black plays yet another move, then Black would have played three more moves in the same area, and I would think that Black is slow. The easier case to argue is Black b. 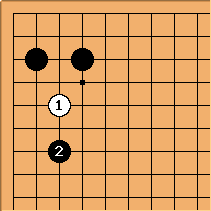 It leaves the possibility for White to pull out at c later, although not necessarily immediately. The other case, Black a, leaves behind quite a bit of aji I don't quite like. I'll elaborate in subsequent diagrams. White can play at , with the aim of pulling out the stone with . White can also consider trying to live in the corner, especially if there are supporting stones at or around. Dieter, thanks a ton for your analysis I definitely needed that kind of analysis. We can also see why White doesn't fear a ko (looks at lower right).